I love Cinnabon, though a combination of calorie guilt and closing locations has made it harder and harder to indulge in these days. My favorite has always been the classic bun with an extra icing – extra flavors and variations have come and gone, with nothing really sticking for me. Well, at least in the ‘pastry’ category. Their coffee is excellent and often worth a trip on its own (though why in the world a nigh-thousand calorie dessert needs a nigh-half-thousand calorie drink to go with it, I can’t say). 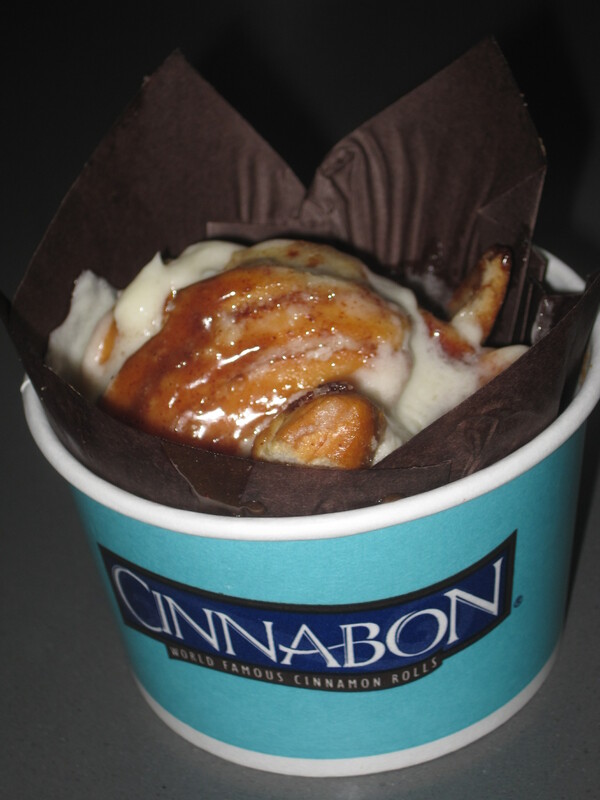 Anyway, this time there was an exception – the Cinnabon Center of the Roll. It reduces the calories down from 900ish to 750ish, which isn’t a huge drop, but you do get to skip the crispy part of the roll and get only the yummiest, ooey-gooey bit. We shared it three ways, for an almost-sorta-decent 250 calories each, and all felt satisfied, probably because it was so rich. It was delicious and, unlike the classic, it didn’t fill the gut and stick to the ribs nearly as much. Often when people try the ‘just get to the good bit’ strategy it doesn’t’ work – imagine an all-filling Oreo or a cake that was all frosting, for instance. They would taste good but would be hard to get down, and you would probably feel quite sick afterwards. This still felt like a substantial desert (and not like all sugar) but it was light instead of heavy and soft instead of a bit hard, as cinnabons tend to be around the edges. It is a simple product but a quite good one, and maybe you can feel slightly less bad about Cinnabon. Not because of the calories – when I ate it I had imagined a much larger calorie discount – but just because you don’t quite have the overstuffed / bloated feeling, or at least not nearly on the same scale.